There are myriad of reasons why a consumer could come back to your brewery’s taproom after their first visit. Making a first impression and then reaffirming it with a second and third, can be a key to making a visitor a loyal consumer. 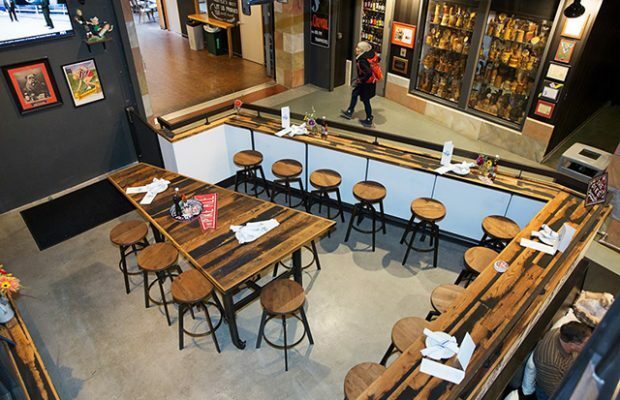 Pike Brewing is a veteran of the industry and the longtime brewery, which opened its new “Tankard & Tun” restaurant to compliment its Pike Pub, shared some tips with Brewer on how it has made its spaces a success. Beer and food pairing: At Pike, we brew our beers to be food-friendly. At The Pike Pub and Tankard & Tun guests can find pairing suggestions for every dish on the menu. Additionally, servers and bartenders are happy to offer individualized pairing recommendations. Cicerone Certified Beer Servers: All employees must past level one certification from the Cicerone Program, and Pike offers in-house classes to help individuals prepare for Cicerone Program exams (a one-time course for level one, and a monthly year-long course for level two), offers study guide materials (books, flash cards, etc), and pays for the test. Microbrewery Museum and tours: Employees aren’t the only folks at Pike encouraged to learn about beer! We love passing beer knowledge on to our guests. Pike’s Microbrewery Museum is free to the public and one of the largest collections of beer art and memorabilia in the world. In addition, our nationally acclaimed brewery tours are offered five days a week giving insight on our unique gravity-flow, steam brewery. Warm welcome: With a kids menu, dog-friendly areas, and ADA accessibility in both restaurants, we strive to make Pike a welcoming atmosphere for all. Our Hoppy Hour menus and military/veteran, homebrewer, Pike Place Market worker discounts work to make Pike an accessible experience for every budget. In addition to beer, our restaurants offer local and small batch wine and spirits as well as non-alcoholic options making them great gathering places for all palates and preferences. Beyond our daily dedication to creating a safe and welcoming space for all, Pike’s commitment the LGBTQ+ community and nonprofits like Planned Parenthood is established through the production of cause beers and fundraising events.